FF’s proprietary VPA is a flexible powertrain system featuring a monocoque vehicle structure in which the chassis and body are a single form – providing measurable improvements in overall vehicle rigidity, safety and handling. An available all-wheel drive system offers greater traction, control and precise power distribution. The VPA also houses class-leading battery technology, multiple motor and battery configurations, as well as the company’s first patent: the FF Echelon Inverter. FF 91’s powertrain features a multi-motor setup, enabling real-time torque vectoring to the rear wheels. This technology delivers superior cceleration, safety while leveraging rear-wheel steering for agile cornering, allowing drivers to confidently execute maneuvers like merging onto freeways or accelerating out of dangerous scenarios. Peak motor power is 783 kW, equating to 1050 HP, delivering a record-breaking 0-60 mph time of 2.39 seconds. FF 91’s battery technology doesn’t sacrifice range for performance. Outfitted with a 130 kWh battery, FF 91 achieves a range of 378 miles (EPA est.) and over 700 km (NEDC est.) from the world’s highest energy density battery, engine ered in partnership with LG Chem. Similarly, the system’s compact design enables more cabin space for greater comfort and safety. FF 91 also has the fastest charge speed currently available, with the ability to charge at more than 500 miles per hour. The home charger, included with the vehicle, achieves 50 percent to full charge in under 4.5 hours at 240V. FF 91’s design philosophy is driven by aerodynamics. The sleek, rounded front fascia and edgy, angular rear create a striking form that improves aerodynamic efficiency to increase range. 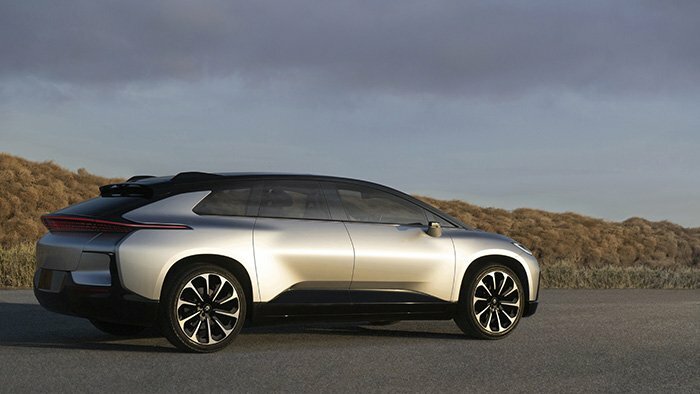 The signature UFO line that runs around the mid-section of the vehicle provides FF 91 with a unique but simple, stabilizing design element. Similarly, the wide stance and long wheelbase delivera spacious and luxurious interior environment. 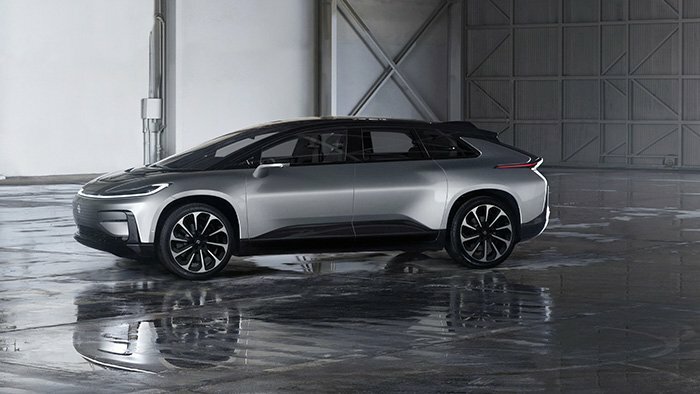 FF 91’s gateway doors blend form and function by providing a stylish entry system with easier accessibility. Each door can open automatically and independently, allowing for quick and convenient passenger pick up. Sensors prevent the doors from opening too wide and making unwanted contact with the surrounding objects. 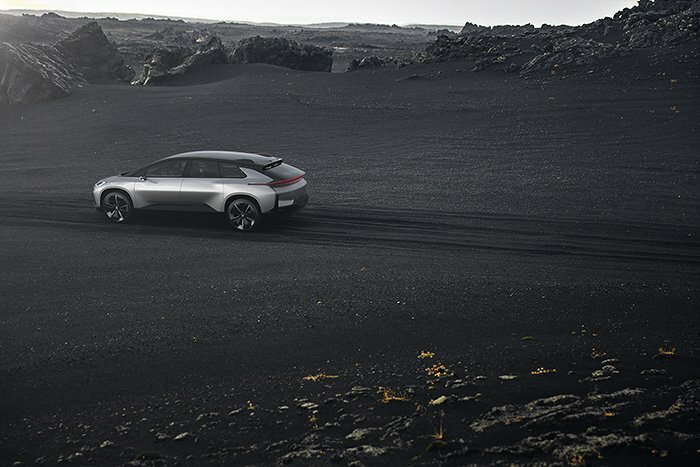 FF 91’s exterior lighting is focused on communication. 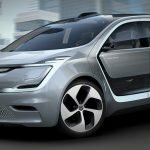 The vehicle reimagines lighting systems by creating a deeper connection between car and driver. When users approach FF 91, the vehicle’srocker panel illuminate with an owner confirmation sequence that brightens based on proximity – FF 91 recognizes and welcomes you. 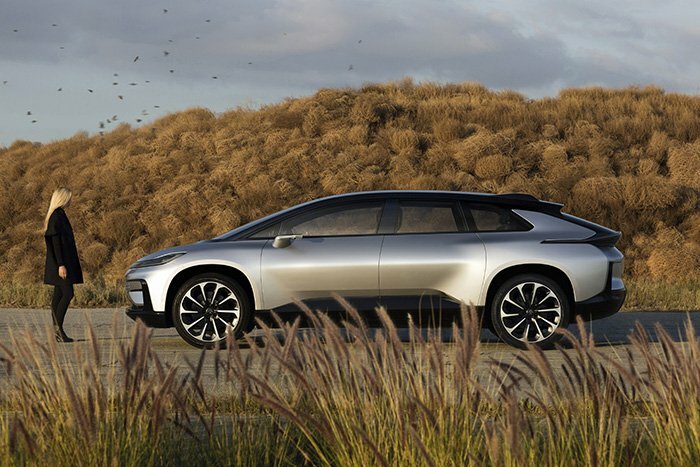 Riding in FF 91, users will feel more rested and energized, even after being stuck in traffic for hours. The rearseats deliver industry-leading rear-seat reclining angles, putting passengers in the biomechanically and ergonomically optimal position for comfort. This first class rear seating experience provides lower leg, lumbar, and upper back adjustments and support. The seats also offer massage, heating, and ventilation for cooling. 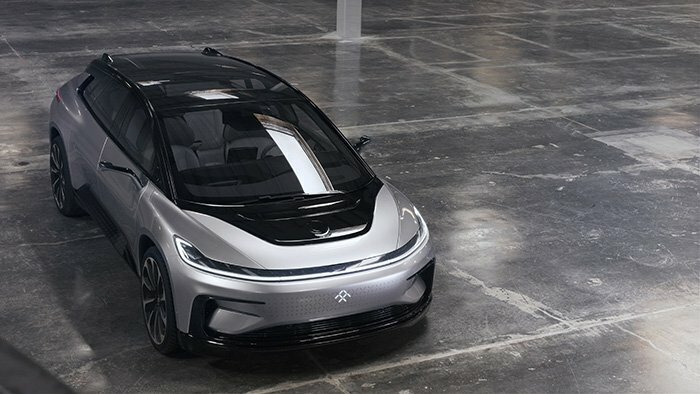 FF 91’s panoramic roof includes smart dimming glass technology. The glass roof , rear and side indows all feature PDLC (Polymer Dispersed Liquid Crystal) glass, which is operated by users tapping on the glass, providing instant privacy and shade from the exterior environment. FF is also introducing advanced facial recognition technology –called Arrival Interface– allowing drivers and passengers to unlock the car without a key. A camera installed in the B-pillar between front and back seats can accurately identify the user’s face to grant vehicle entry. Similarly, interior cameras use this technology to recognize users and automatically adjust interior settings to their preferences. FF 91 can not only recognize faces, but also facial expressions and moods it uses to auto-prompt an experience to match, using music, temperature, scent, content, massage and more. Users’ facial recognition data is saved natively and securelyin the vehicle. In addition to adjusting interior preferences via facial recognition or mobile device connectivity, FF 91 is the first car where you don’t need a key. The keyless welcoming system recognizes users as they approach the vehicle, greets users by opening the door and proactively adjust ing to customized FFID settings inside. 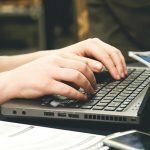 Similarly, the FFCTRL app allows users to customize and control their in-vehicle experience, get real time vehicle status reports, summon your vehicle, and more. 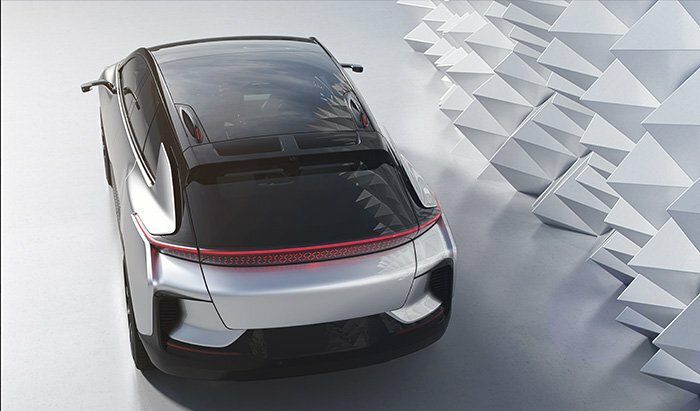 The Driverless Valet parking feature enables FF 91 to park itself after the driver has exited the vehicle. Powered by the FF CTRL app, drivers can also summon the vehicle from its parking spot or schedule a pick up at a desired time and location. Today, the system is capable of parking FF 91 in private parking lots and roads. 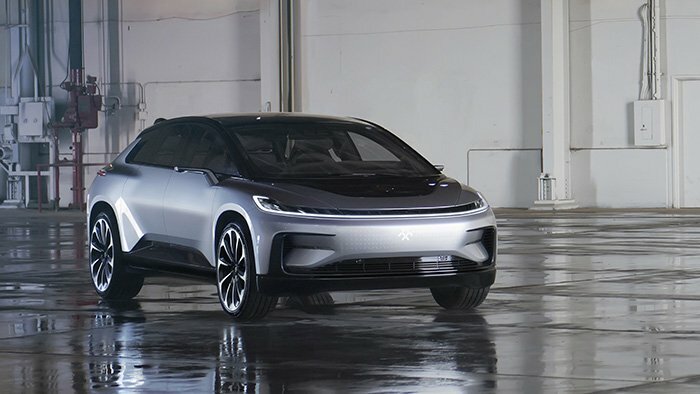 As legislation advances to allow for public use of this technology, FF 91 will be able to park itself anywhere users go.